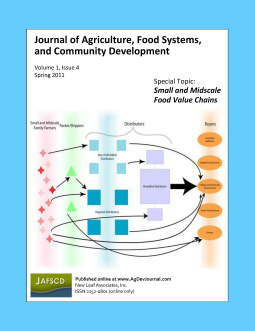 In this issue of JAFSCD we present the state of the art in small and medium-sized food value chains — primarily from a North American perspective, but also with perspectives from Europe and South America. Values-based food supply chains (value chains) are strategic alliances between farms, ranches, and other supply chain partners who deal in sufficient volumes of high-quality, differentiated food products and distribute rewards equitably across the supply chain. As Stevenson and colleagues remind us, in FVCs, farmers and ranchers are treated as strategic partners, not as interchangeable — and exploitable — input suppliers. Ideally, all partners in these business alliances recognize that creating maximum value for the product depends on significant interdependence, collaboration, and mutual support.